In February 2010, total U.S. industrial production rose +1.7% year over year according to the Federal Reserve. While there was continued expansion, production growth fell from Q4 2009’s +6.6% rate and Q3 2009’s +6.4% growth. Still, overall industrial production kept growing in February. But… diving into a breakdown of different products by market shows that some U.S. industries have already experienced sharp reversals of fortune. 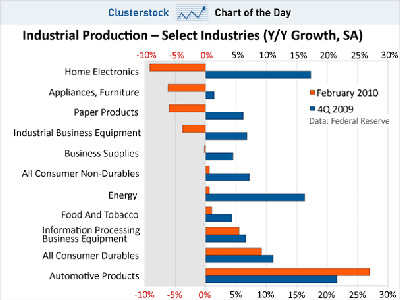 As shown below, U.S. industrial production contracted sharply in February (orange bars) for Home Electronics, Appliances & Furniture, Paper Products, and Industrial Business Equipment. This came after strong growth in Q4 (blue bars). Thus for some the recovery already feels like it’s over.